After couple of months after finishing my first bottle of this particular batch , I had urge to open another one, despite having couple of sherry bombs already opened. This one just keeps calling me back, and its beautiful from get go. 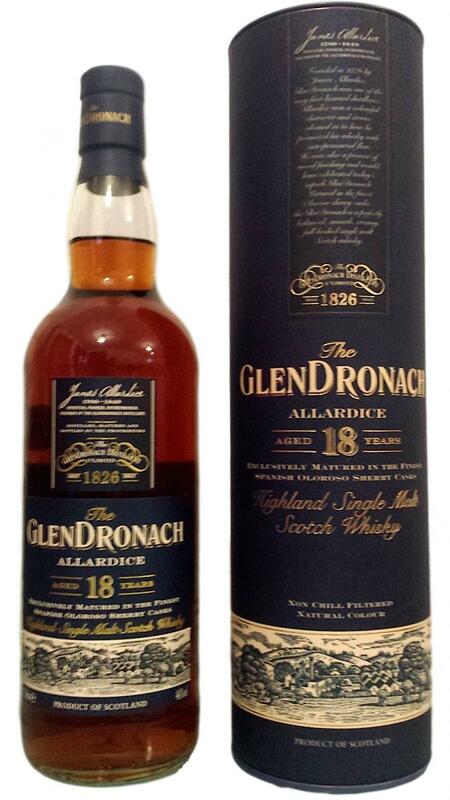 This is my 3rd Glendronach 18 and one thing is that , this bottles going quick. Im drinking occasionally for past couple of years, sometimes one dram a month as i dont have desire for hard alcohol most of the time. 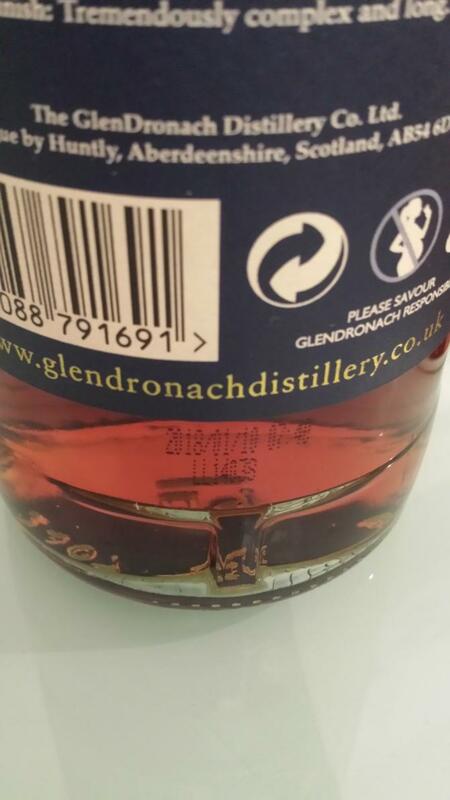 But when Glendronach 18 is opened it lasts max 3-4 months. Its a shame really, because they start opening so nicely just about that time. The fruits are not present a lot and I must say and if I have off day its 88 points ( but that goes for every whisky ) and if the stars are aligned then I would score it 93 points. As a default I scored it 91 points. But the fruits ( candied dry fruits mix, raisins, plums, berries ) do comeback after the bottle is opened for 4+months. 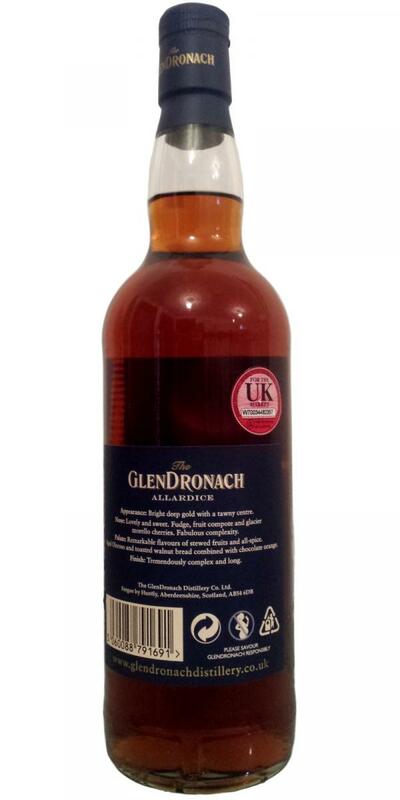 Im Glendronach fan ( this juice is still from direct fired stills ) and I really appreciate the profile of this particular expression so Im giving it couple of extra points from these reasons. Just a quick review as i already have done one before, but i must say this bottle feels more relaxed from get go, while the first one was more restrained. Dryer arrival but become nicely juicy after entry, beautiful development again, more of the coffee ( espresso made from roasted arabica coffee beans with demerara sugar ) and dark cocoa mounthfeel supported with honey and caramel sauce, hints of spearmint, Dry Berries, touch of chocolate covered raisins and plums, all ripe, solid development and structure of flavors. A dynamic dram where the experience keeps you busy, no off or unexpected notes. Aroma: delicate, but at the same time rich, raisins, figs, dates, sweet pastry pastry goes further: shortbread with berry jam honey and roasted nuts; the second wave is already a variety of dried sour-sweet berries and a hint of wood, flavored tobacco and some spices. Awesome scent! Very complex, rich in halftones, constantly evolving. Taste: a mixture of dried fruits, both exotic and not very, light pepper, star anise, cinnamon, cloves, pleasant wood tannin, further coffee beans, dark chocolate, notes of dark beer. Finish: long, spices, dark raisins, prunes, walnut and its astringent partitions, beef broth, chocolate, and again a little astringent wood tannins. A kaleidoscope of spices and spices gradually passes into dried fruit, and then into fatty nuts. Clearly the older brother of the 15er. But more sherry dominating and a little more on tap. The quality is considerable. PLV clearly perfect. As a special one has immediately the red wine notes and the well-known matchmaking effect. I like that. Then the whole Christmas market with good espresso in the air. Gentle woody spice notes in the background. If now the wood breaks through then rather in the bitter direction. Too bad. But quickly comes the creamy sherry effect. Now orange caramel in plum jam. He is full-bodied and deliciously oily. But .... something bothers me on the bitter side. Still great palate! Rather long and with cough syrup like mouthfeel, he slowly leaves the stage. He stays wonderfully sweet. In the background still a woody menthol taste. Has something. 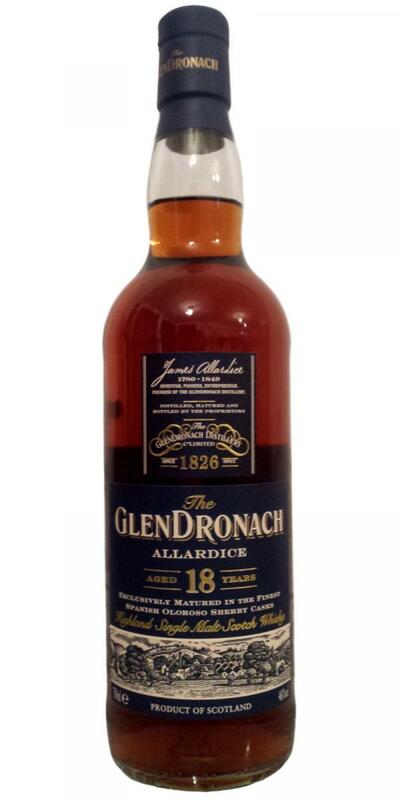 Glendronach 18 year old Alladice is rather the game of two halves – starting sweet, rich and deeply sherried on the nose and front palate, it rapidly becomes peppery and dry on the back palate and particularly in the finish. There’s not a huge amount of complexity here, but all the contrasting elements come together nicely to form a tasty, well-made sherried-forward expression. No doubts about the oloroso influence here – immediate raisins, dates and caramelised figs. These are supported by chocolate, sponge cake and some heady tobacco leaf notes – fresh and golden, but still slightly oily and sticky. In the background, stewed stone fruits – lurking – hidden behind a wall of dried berries. There’s a touch of malt here, and likewise hazel nuttiness and gentle spicing – white pepper. The addition of water heightens the tobacco aroma further and adds some ground coffee beans. A rich and syrupy arrival packed full of reduced berry fruits, chocolate, coffee grounds. Then, quite a perceptible minerality comes to the fore – wet granite, slate, flint. It provides some sharpness and juxtapositions nicely against the intense sweetness of the sherry. Mid to back palate, slightly more tropical fruits – foam bananas and mangos, but still well within the grip of Mr Oloroso. Pepperiness again, slightly intense, prickly and certainly more pronounced than on the nose – as well as spicingness, this adds quite a lot of dryness. A few drops of water adds some orange peels as well as bringing out the underlying cask influence with some bitterness. Long, quite peppery and very drying. This whisky have luxurious presence, its well balanced and rich dram where all the raw edges were graciously smoothed out with long maturation. This is a smooth operator. Only drawback I would say I didn't get much or any fruits I used to get with older releases. Still very fine drop though. If you love chocolate and coffee then you should love this. It need fair time in glass to open up from my experience. I have this bottle opened for only a week and it becoming better, after opening it was very closed/muted. Update: After having the bottle almost finished 2 months later, the dry, candied, dark fruits seems to make a presence! 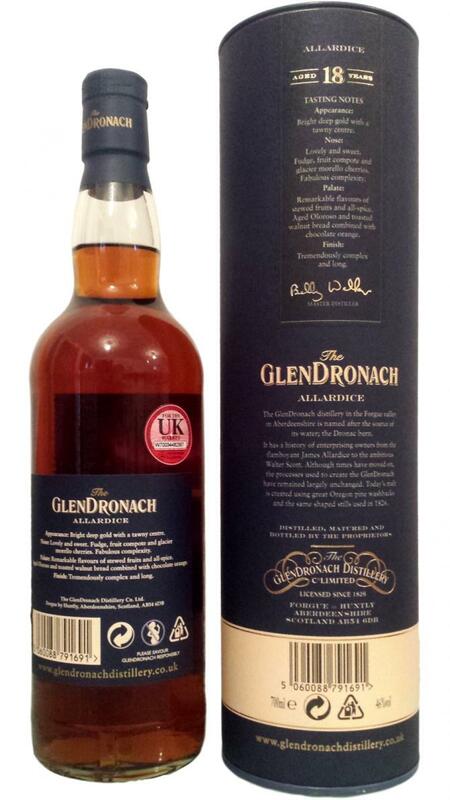 Beautiful dram if you give it 2-3 month to breathe in bottle. Now I like it even more. Initially dry but in waves becomes juicy. Again dark chocolate and cardamon spices, nougat, espresso coffee, after about 30 minutes in glass hint of chocolate orange ( more like dark chocolate ), maraschino cherry, dry prunes. All gives luxurious mouthfeel. the sweetness is well under control with the oak spices.